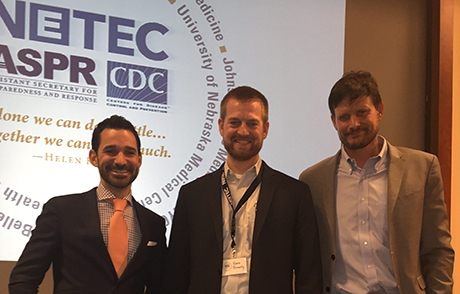 Ebola virus disease survivors and physicians Craig Spencer, MD; Kent Brantly, MD and Ian Crozier, MD, recounted their experiences during a survivor panel at the NETEC Summit. Health care providers from 10 medical centers around the U.S. designated by the government as regional Ebola treatment centers spent two days learning and sharing experiences, expertise and best practices at the National Ebola Treatment and Education Center (NETEC) Summit. The summit was held on May 11-12 at Emory University. NETEC is led by faculty and staff from Emory University, the University of Nebraska Medical Center/Nebraska Medicine and NYC Health + Hospitals/ Bellevue. All three health care facilities safely and successfully treated patients with Ebola virus disease in 2014. A $12 million grant from the U.S. Department of Health and Human Services’ Office of the Assistant Secretary for Preparedness and Response (ASPR) and the Centers for Disease Control and Prevention (CDC) funds the program. Over the past year, Emory, Nebraska and NYC Health + Hospitals/Bellevue have focused on sharing their knowledge and training and preparing other health care facilities and public health jurisdictions to safely identify, isolate, transport and treat patients with Ebola virus disease and other emerging threats. Topics on wearing the proper personal protective equipment (PPE), setting-up a dedicated lab to handle blood samples from highly infectious patients and managing pediatric and pregnant patients with Ebola virus disease were covered in break-out sessions at the conference. Three U.S. Ebola virus disease survivors recounted their experiences during a survivor panel at the summit. Physician Kent Brantly, MD, who was treated at Emory University Hospital and was the first American patient brought back to the U.S. for treatment of Ebola virus disease, says this conference is critical for planning and preparation for future communicable illnesses. Ian Crozier, MD, an infectious disease physician, was Emory’s third patient diagnosed with Ebola virus disease. He praises the unique care given to patients with Ebola at the bedside. Emergency medicine physician Craig Spencer, MD, was treated at NYC Health + Hospitals/Bellevue for Ebola virus disease in 2014. He says being an Ebola survivor has changed the way he cares for his patients now in the emergency room. Summit participants learned that Ebola has taught both the survivors and their care teams many lessons. “Bellevue does have a long history of responding to infectious disease crises, but Ebola represented a new challenge for us and I think the challenge isn’t over for us, or for others around the globe,” says Laura Evans, MD MSC, medical director of Critical Care, NYC Health + Hospitals/Bellevue. The take-home message for conference attendees – preparation and planning are key. Brantly knows that message all too well. For future NETEC training conferences, visit http://netec.org/.